(Sept 25, 2014) Stig said: I worked their for my brother Gez who was the manager. Loved the place and its wide variety of customers. Selling imports new releases classics and my favourite the second hand section where I got most of my albums. I was there at the dawn of CD's and the transition from vinyl. Not sure who the guy who didn't know that hendix had died was perhaps a Saturday boy or more likely someone being scarcastic as we all prided ourselves in our knowledge. Hawk Gez Jason Damian Mark where all people I can remeber working with and it was a home for rockers on a Saturday a social place. Sadly missed and I think those days are gone. There has opened a record shop recently by the once owner, I think, Mike Lloyd. Hope it stir memories for the next generation. (June 29, 2015) Lotus in Hanley was the place to hang out in the late 70s early 80s although you had to go to Mike Lloyds to get your concert tickets for the Vicky Hall. Hard to believe that with Terry Bloods and Mike Stones shop there was at least four record shops in Hanley in those days plus Woolies, Smiths and Boots. An indication of just how many records were being sold in those days. Comment: Phillip Smith. (October 17, 2015) The picture of the record bag brought back some great memories of the place in the late 70s. I seem to recall that the shop moved within the arcade a couple of doors down in around 1979? 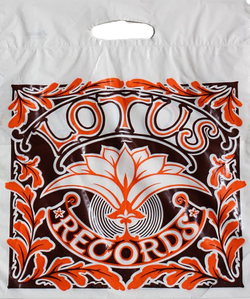 Can anyone remember the name of the record shop that preceded lotus in the arcade? It's been on the tip of my tongue for the past 30 years! Comment: Julian Smith.